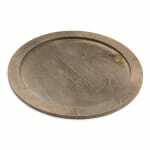 The 11 inch round wood underliner by Lodge guards your tables and countertops against discoloration and other damage when used with the round handleless griddle. The underliner's durable construction also enhances the visual appeal of fajitas or other sizzling dishes. "This hasn't been used as yet - I bought it for my grillmeister husband. The cast iron seems ok, but the underliner is disappointing, it is not a..."
"This hasn't been used as yet - I bought it for my grillmeister husband. The cast iron seems ok, but the underliner is disappointing, it is not a pretty walnut, nor nicely finished. I'm just hoping for functionality at this point."